When it’s finally time to do something about your family law matter call John! Not sure on how to get started on your case call John! If your case is not completed and you want it finished call John! It starts with an overview of your rights, duties and responsibilities during the initial consultation. Mr. Guzman believes you should be advised of your rights the very first time you consult with him. This gives you a realistic overview of what he can and can’t do for you. 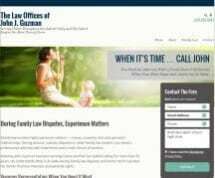 If your issue is divorce, custody, visitation or support call John. Not sure about how California law applies to your small business and how it relates to support and property division? Call John. During your initial consultation the issues important to your future will be discussed. John is experienced with family law issues having been an attorney since 1989. John still has a passion to help people with their family law problems and has the staff to assist you in all stages of the process. Resolving the break-up of your relationship and issues such as custody, support, assets and debt are awkward at best. Sometimes much worse. John will see you through the process with professionalism and compassion. From starting your divorce to final judgment of dissolution, John will help you obtain your divorce, paternity or resolve your post-judgment issue. Need to modify an old order? Set an appointment to discuss the pros and cons of proceeding. Communication with clients is the foundation of a good working relationship. You will always have access to John via a face appointment or a telephonic appointment. Email is also a modern and efficient way to maintain communication between you and your attorney. This has been his way of doing business since he started in 1989. If you have the funds to hire an attorney, consider calling John. You can’t avoid the fact that fees will be generated in your case if you chose to be represented. You deserve to hear the good news and the bad news regarding your case initially so you can prepare your future. Mr. Guzman will go over support issues in a general way so you can start formulating a realistic budget for your future. You deserve to hear this information as soon as possible in the process so you can plan the future for you and your children. If you must represent yourself then we will prepare your documents and have them properly served. The attorney-client relationship is based on a working business relationship. John is very reasonable at billing his clients. John bills by the tenth of the hour not by the quarter hour. John also does not charge you for every page of paper or stamp. Excessive document copying is at a reasonable fee. You should know these things when choosing an attorney. The best way to start is to set a confidential consultation with John. When you are finished you will have a sense of the process as it relates to you, a budget based on support obligations and a set of goals on how to proceed. John is not timid about what he thinks you chances are give the facts presented. When it’s time call John.